In dynamics 365, there is way to import data using entity templetes. We can download this template for any entity and import data into Dynamics 365. Here are the steps. Login to your organisation and navigate to ‘Settings’ area and select ‘Data Management’. Click on ‘Templates for Data Import’. This is the popup window will be shown after completing step 2. From the dropdown we can download template for any entity. Choose entity and click download button. Open the downloaded template add any number of records in it and save the excel file. Now navigate to ‘Settings’ -> ‘Data Management’ and click on ‘Imports’. Click on ‘Import Data’ button. Now, click on ‘Choose file’ button and select your saved excel file from step 4. 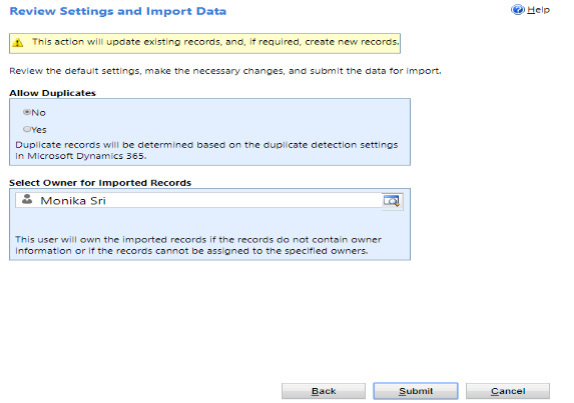 Here you can allow or restrict duplicate records creation based on duplicate detection settings. You can also change the owner of the records by selecting from the user lookup. By default, login user is selected as the owner of importing records. Click ‘Submit’ button to start importing. Initially importing status reason shows as ‘Submitted’. The total number of records processed will be shown under ‘Total Processed’ column. Record count of successful import will be shown under ‘Successes’ column. If any error occurred during import, those record count will be shown under ‘Error’ column. We can double click on any record and see the import information such as success, failure reason etc. after the completion of import process the status reason will be changed as ‘Completed’. Now navigate to ‘Sales’ area and select ‘Accounts’. That’s it. Account data imported successfully. You can change the view and see the data as you wish.